Curse of Naxxramas: The Military Quarter - Now Open! It’s time to take your training to the next level with Curse of Naxxramas’s Military Quarter! The Military Quarter is home to Naxxramas’s finest undead knights, ready to take on all interlopers that dare test their skills in battle. Victory over these masters of melee will reward you with all-new Hearthstone cards! The first boss players will encounter in the Military Quarter, Instructor Razuvious is destined to train all of the Death Knights risen within Naxxramas for all eternity. 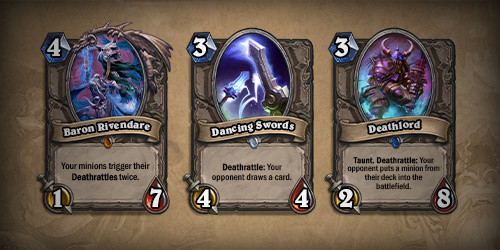 Defeating Instructor Razuvious will reward you with two copies of the Dancing Swords card for your collection. Be sure to keep your footing against the sheer power of Razuvious’s Unbalancing Strike! A knight risen to serve Kel’Thuzad finds additional training with the second boss of the Military Quarter, Gothik the Harvester. Manipulating the souls of the undead is Gothik’s specialty, and his defeat will spirit two copies of the Spectral Knight card into your collection. Kel’Thuzad’s elite guard can be found in the last boss encounter of the Military Quarter: the Four Horsemen. Sir Zeliek, Lady Blaumeux, Thane Korth’azz, and Baron Rivendare join forces to bring down any Hero who dares cross their path! 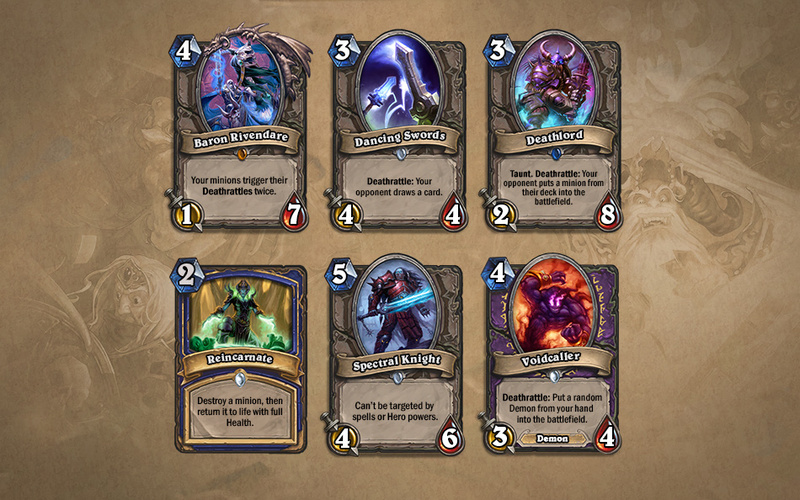 Their defeat will recruit two copies of the Deathlord card to your collection. 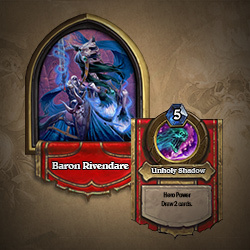 Defeating all of the bosses within the Military Quarter will add the Legendary Baron Rivendare card to your collection. The Military Quarter also features two Class Challenges that will become available to those who have defeated the bosses on Normal Mode. Overcome these Challenges and you’ll be rewarded with new class-specific cards to expand your repertoire. For those of you seeking out a serious challenge, Heroic Mode of the Military Quarter becomes available after you’ve defeated all of the bosses on Normal Mode! Heroic Mode bosses are significantly more difficult than their normal versions, and the Heroic Military Quarter bosses are dying to humble any would-be hero brave enough to face them! Having fun in the Military Quarter is a part of your training, soldier! 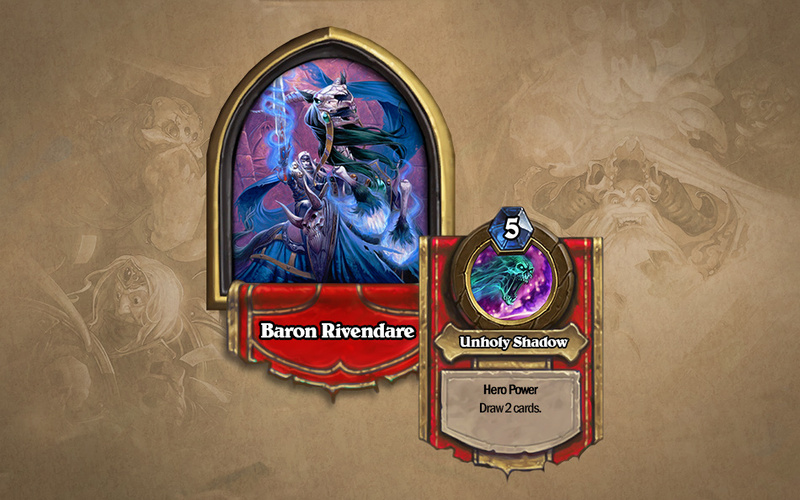 Experience the Military Quarter in Curse of Naxxramas: A Hearthstone Adventure today!